Be sure to call, or just send in your RSVP’s and Donations now for this fun and much anticipated event!!! Call 452-8160 and one of our happy elves will gladly assist you!!! Don ‘t miss the largest building show in Clallam County. The 21st Annual Building, Remodeling & Energy Expo will be held on February 17 and 18 at the Sequim High School. Doors open Saturday at 9 am and Sunday at 9 am. There will be demonstrations all day on both Saturday and Sunday; with topics including energy efficiency, solar economics, how to select a builder, design build projects, composting, and more! Maggie May Espresso and Outfitter, voted best food truck in all of Washington will be offering food concessions with a special “Builder Burger” created just for this event. Enter to win one of two $500 shopping sprees offered by Hartagel Building Supply or Angeles Millwork & Lumber Company. Capstone sponsor of this event is the Clallam County PUD, who is happy to address all your energy saving questions. Click HERE for your 2018 EXPO REGISTRATION ………..do it today! 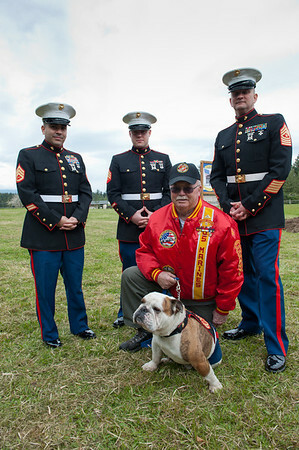 Cpl Lang’s Groundbreaking Ceremony photos have just arrived from Patrick Downs Photography! Click on the photo to start slideshow of the event. NPBA’s annual Builder Surplus Sale that was to take place on April 20 from 12-3 pm at the Clallam County Fairgrounds has been rescheduled for a later date, to be determined in the late summer/early fall as we work to acquire more donations for the sale. Join us to welcome Cpl. Ammon Lang to our neighborhood! On April 27 at 10:00 am, a groundbreaking ceremony will take place for Cpl. Lang’s home at 72 Hidden Highlands Drive. We are excited to be a part of this great project and hope you will join us to welcome Cpl. Lang and his family to the beautiful Olympic Peninsula! To meet Cpl. Lang, click here, to learn more about Homes for our Troops, click here. If you would like to participate in helping us build Cpl. Lang’s home, give us a call at 360-452-8160. The 16th Annual Building, Remodeling and Energy Expo is almost here! We are so excited that the Expo is right around the corner! Join us April 6 & 7 on the Sequim High School Campus for a great show with over 70 exhibitors to meet, free demonstrations and presentations, and your chance to win one of four $250 shopping sprees to Hartnagel Building Supply or Angeles Millwork. Recently, NPBA appeared on KONP’s Todd Ortloff Show with our Capstone Sponsor Clallam County PUD. Listen here as NPBA Executive Officer, FaLeana Wech and Clallam PUD”s Utility Services Advisor, Mattias Jarvegren fill us in on all of the exciting things that will happen at the Expo this year! For more information visit our Expo website at sequimexpo.com. The NPBA is pleased to announce that Dr. David Crowe-Chief Economist, NAHB will speak at our general membership meeting on Thursday, March 21. For more information about the event and to register, visit the NPBA Housing Forecast Eventbrite Page. Last week, many members of NPBA and the community attended a workshop that focused on how to obtain mitigation certificates & building permits under the new Dungeness Water Rule. If you own property in WRIA 18 East, this rule applies to you. The county has done some excellent work to get a map up for identification. Click here to view it. Here are some takeaways from the meeting. This rule applies to those who are living within the boundries of WRIA 18 East. If prior to Jan 2, 2013 you were already using your well to water gardens, orchards, animals, etc…then you can continue on as you have already established those uses. Say though, you moved in last summer and were only using your well for indoor use and this summer, you wanted to plant the orchard you always dreamed of. If you live in the yellow areas, you will need to wait till mitigation water is available to do so, this is where no outdoor watering is available to purchase at this time. It may be available as soon as summer but we don’t know the exact date yet. Mitigation is required for existing well owners who want to use water for a “new use”. Things like building an accessory dwelling unit, getting some farm animals, planting a garden you’ll need to purchase mitigation. Caution: see #3 below about just how much of the 20 acre parcel you purchased you will be able to water. The cost for the indoor mitigation with 150 gallons (average) per day indoor water is $1000. When outdoor packages become available, you will be able to water approximately 2500 square feet (.06 acres) with the purchase of the indoor/basic outdoor package at a cost of $2000. The other option available will be the indoor with extended outdoor package, this will allow you to water 5625 sf (.13 acres) at a cost of $3000. Click here to see the chart that was provided as a handout. The first 100 building permits applied for by June 30, 2013 will be eligible for a $1000 grant to defray the cost and a budget request has been submitted by DOE to provide further assistance beyond that date. There are many areas that exist that do not have outdoor watering available for purchase at this time, see this map (or the one above-click on it to view a more readable PDF)-the yellow areas are where no outdoor mitigation is available presently. At some point-perhaps more towards the summer, some of the areas in yellow property owners will be able to purchase outdoor mitigation but we are aware that there are areas that exist that will unable to water outdoors forever. It would have been helpful for the public to have had access to this map throughout the rule making process but one was never made available. A copy of this map was found through a public records request and circulated in November of last year. We were advised that this map was prepared with limited data and that Ecology chose not to post it because it would create more confusion and that we should contact the WA Water Trust or County about specific parcels if there were questions. Unfortunately, the County didn’t have the information they needed to help landowner’s answer their questions as the boundaries were still being worked out. In the end, the final map turned out to be very similar to the one found in the PDC request. Clallam County Department of Community Development will be there to assist you through this process-they will be the “one stop shop” to guide you. To see how the whole process will work, check out this slide show. They have been hard at work dealing with many moving targets and we thank them for all of their efforts to assist county residents. We are very concerned for our members and property owners in the affected area. If you are, please send an email to info@olympicresourcepc.org or contact Greg McCarry at 360-509-0633. The ORPC is a group that is fundraising to present a legal challenge to the rule. Please share this information. OLYMPIA—The list of Washington State housing markets on the January National Association of Home Builders/First American Improving Markets Index (NAHB/IMI) surged from three in December to six in January, reflecting a nationwide bump of 20 percent—from 201 to 242 improving metro areas. The Bellingham, Kennewick, Longview, Seattle, Spokane and Yakima housing markets are listed on the January IMI due to a marked uptick in house prices, employment and new building activity. The index is released every month and identifies housing markets that have shown improvement for at least six consecutive months using three sets of independent monthly data: employment growth from the Bureau of Labor Statistics, house price appreciation from Freddie Mac and single-family housing permit growth from the U.S. Census Bureau. Seattle, Spokane and Yakima remain on the list from December, whereas Bellingham, Kennewick and Longview are new additions to the improving markets list. As an integral driving force for local, state and national economies, housing’s health is vital. It’s an excellent sign that Washington State boasts six of the 242 markets on the January IMI. To access the complete list of all 242 metropolitan areas currently on the IMI, and a separate breakout of metros newly added to the list in January, visit: www.nahb.org/imi. Recent research and data from BIAW, NAHB and the US Census Bureau provide an irefutable case for the benefits of home building. New home construction is a leading revenue and job generator in the state of Washington and, if encouraged, could lead the state’s economic recovery. NAHB Senior Economist Dr. Elliott Eisenberg shows us how and why in this entertaining, interesting video highlighting the economic impact of new home construction in Washington. Click here to view. The NPBA has chosen the Boys & Girls Clubs of the Olympic Peninsula as our charity partner to help promote our Facebook Page. For every “Like” NPBA receives, we will donate $1 to the Boys & Girls Club up to $250, but wait–if you can help us reach our goal of getting 250 “Likes” by their Annual Auction on November 10, we will double our contribution to $500! We are almost halfway there, please take a minute to “Like” us at facebook.com/NorthPeninsulaBuildingAssociation and help us reach our goal.